I’m starting with a link to a PDF file of an article of mine in the current issue of the American Birding Association’s magazine, Birding, about hearing aids specifically for birders. Immediately after it came out, I started getting emails from people wanting more information about my own hearing aids. The model I use is Phonak Audéo V, and I love them, but I’ve never tried any other brand or model. Without comparing them to anything else that may be as good or better, and may be less expensive to boot, I can’t recommend them outright. They’re doing a wonderful job of bringing in birds I couldn’t hear anymore. 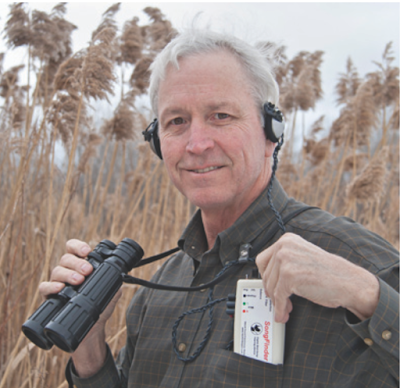 When my article came out, Ted Floyd posted a 3-part piece in the American Birding Association’s blog about his own hearing loss. In the blog, he posted a sound file for an Allard’s ground cricket—a sound he suddenly cannot pick up with one ear. I played the recording on my laptop while I was visiting my sister-in-law. I didn’t have my hearing aids in, and could not hear it at all, even with the sound cranked all the way up, but my sister-in-law heard it with ease when she wasn’t sitting all that close. With my hearing aids I can hear the recording just fine, and even better when I set them on the personal setting my audiologist created to help me hear high-pitched natural sounds better. But as helpful as my hearing aids are, as my Birding article goes into in depth, I still can’t hear high-pitched sounds from more than a few meters away. To bring in distant Le Conte’s Sparrows, Golden-crowned Kinglets, and those Allard’s ground crickets, I use another device, Lang Elliott’s SongFinder. It works by lowering the frequencies by half or even more of high-pitched songs, so they don’t sound normal, but the pattern helps identify them. 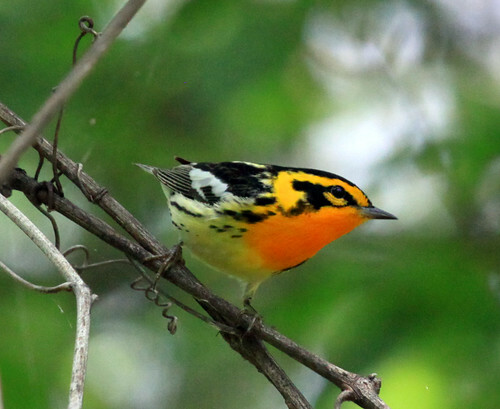 You can listen to several examples, including one of my favorite high-pitched singers, the Blackburnian Warbler, as they sound naturally, and as the SongFinder changes it, on the Hear Birds Again webpage. As I wrote about in the Birding article, with this cool device, I could hear high-pitched birds from as far away as two 29-year-old birders could hear them. With both my hearing aids and the SongFinder, I can hear nearby birds as beautifully as ever, and can pick out distant birds as well as anyone else. Some people think hearing aids are a sign of old age. But mine make me feel young again because I can hear the birds I love. Please post comments about your specific birding experiences with hearing aids and any tips you have that can improve people’s experiences with hearing aids. Comments are moderated so I can keep spam and self-promoting posts to a minimum. Sixty-four has always seemed to me to be the precise threshold to old age thanks to the Beatles, so since my birthday this year, I’ve decided I might as well embrace it. This new website will be specifically focused on the needs of birders dealing with the issues we often associate with aging, such as vision and hearing problems, circulation, skin cancer, accessibility problems, lugging and controlling heavy optics and camera equipment, etc. In reality, every one of these issues affects young people, too, and many birders of very advanced years only deal with one or two of them, but I’m not going to shy away from identifying myself as old enough to join AARP—heck, I’ve been old enough to meet AARP’s membership threshold for 14 years now. 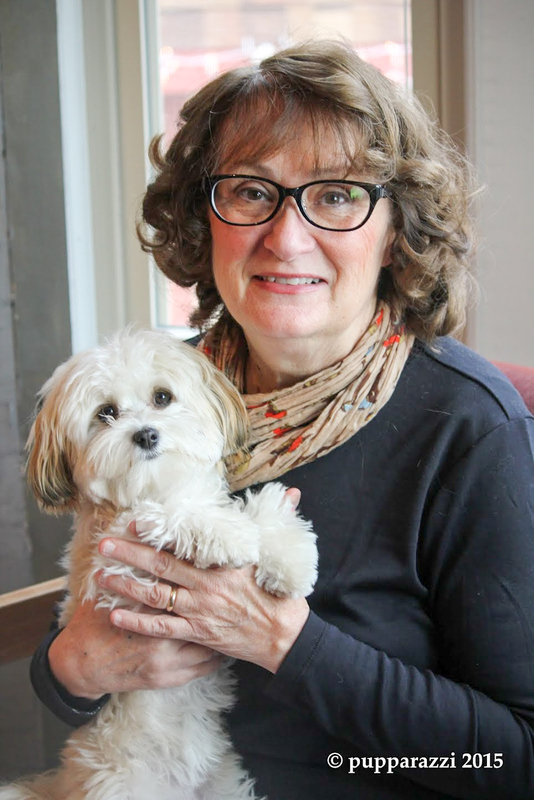 I’m also embracing the old stereotype of the “little old lady in tennis shoes,” since I am, indeed, a 64-year-old woman who does, indeed, wear tennis shoes or today’s equivalent. The shocking thing to me is that no one else had snapped up the website littleoldladyintennisshoes.com before this, but now it’s mine, and it’s where I’m going to be posting information about these issues. Please make detailed comments on posts when you've had experience with the issue under discussion. If you can recommend products that are especially useful, feel free to do so, but the more details of your personal experience, the better. I will try my best to delete all commercial and self-promoting comments. 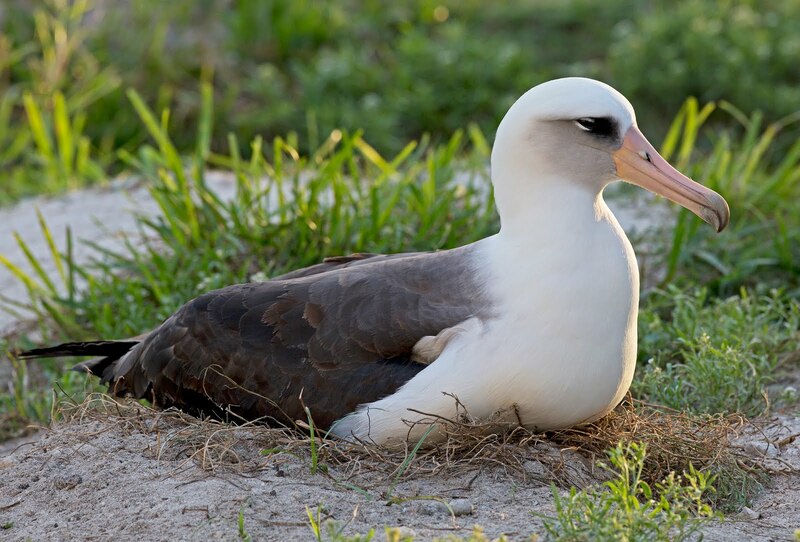 Wisdom the Laysan Albatross was banded as a nesting adult on December 10, 1956, by Chandler Robbins. That means she's at least 64 years old now. But she's still able to defend a quality nesting territory, attract a mate, and produce eggs. People always gave lip service to the idea that "you can't judge a book by its cover" and "beauty is only skin deep." But Nancy Kulp played roles that were among the only ones we little girls of the 50s and 60s saw where a woman didn't worry about being stylish or "cool," and didn't feel self-conscious about being interested in birds and nature. She was the best role model we girls had for someone who didn't care at all about what other people thought of her, and I loved her.